Wilbur Ross, the 39th Secretary of Commerce, who recently announced his department’s plans to become a “one-stop shop” for regulating the space industry, will discuss how the Department of Commerce is creating conditions for economic growth and opportunity for the people of the United States at a National Press Club Headliners Luncheon on Monday, May 14, 2018. 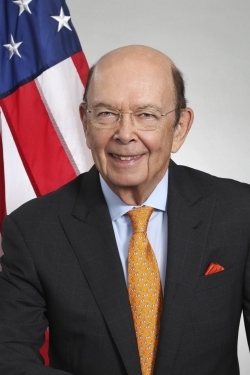 Secretary Ross, a former bankruptcy specialist and billionaire American investor, has been an increasing ly common fixture on CNBC amidst the United States’ looming trade war with China (a result of President Trump’s deluge of new tariffs and changes to US trade policies) and his recent decision to overrule officials in the Census Bureau, an agency housed within the Department of Commerce, on the inclusion of a controversial citizenship question in the 2020 census. Wilbur L. Ross, Jr. was sworn in by Vice President Mike Pence as the 39th Secretary of Commerce on February 28, 2017. Secretary Ross is the principal voice of business in the Trump Administration, ensuring that U.S. entrepreneurs and businesses have the tools they need to create jobs and economic opportunity. Secretary Ross is the former Chairman and Chief Strategy Officer of WL Ross & Co. LLC and has over 55 years of investment banking and private equity experience. He has restructured over $400 billion of assets in the airline, apparel, auto parts, banking, beverage, chemical, credit card, electric utility, food service, furniture, gypsum, homebuilding, insurance, marine transport, mortgage origination and servicing, oil and gas, railcar manufacturing and leasing, real estate, restaurant, shipyard, steel, textile and trucking industries. Secretary Ross has been chairman or lead director of more than 100 companies operating in more than 20 different countries. Named by Bloomberg Markets as one of the 50 most influential people in global finance, Secretary Ross is the only person elected to both the Private Equity Hall of Fame and the Turnaround Management Hall of Fame. He previously served as privatization adviser to New York City Mayor Rudy Giuliani and was appointed by President Bill Clinton to the board of the U.S.-Russia Investment Fund. President Kim Dae-jung awarded Secretary Ross a medal for helping South Korea during its financial crisis and, in November 2014, the Emperor of Japan awarded him the Order of the Rising Sun, Gold and Silver Star. As a philanthropist, Secretary Ross has served as Chairman of the Japan Society, Trustee of the Brookings Institution and Chairman of its Economic Studies Council, International Counsel Member of the Musée des Arts Décoratifs in Paris, Trustee of the Blenheim Foundation, President of the American Friends of the Rene Magritte Museum in Brussels and Director of the Palm Beach Civic Association. He also was an Advisory Board Member of Yale University School of Management. Secretary Ross is a graduate of Yale University and Harvard Business School (with distinction). He and his wife Hilary Geary Ross have four children, Jessica Ross, Amanda Ross, Ted Geary and Jack Geary. ... a total of 18 guests.